What a magnificent plant. Canary yellow flowers with enormous sail like leaves. Pleurothallis (Acronia) titan is one of our most distinctive orchids and one a handful of gigantic pleurothallid species. A mature plant stands about 3' tall. You might mistake the heart shaped leaves for an Anthurium, except for the characteristic "frog" flowers appearing near the top, identifying it as a pleurothallid in the subsection (or section) Macrophyllae-Fasciculatae. 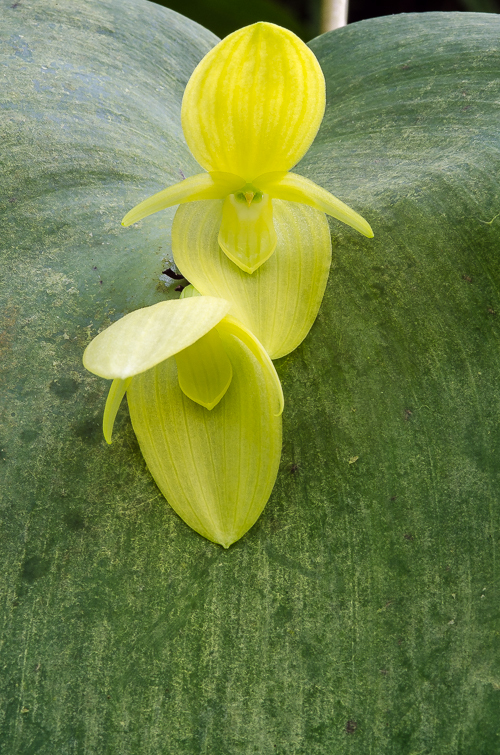 Pleurothallis titan grows as an epiphyte in cloud forests in the western cordillera of Colombia and in Panama at about 1000 to 1300 meters elevation. The species was described by Carlyle Luer in Selbyana in 1977 as Acronia titan. Our plants flower almost continuously in the Tropical High Elevation House. You can't miss them. They do well as terrestrials in our loose soil medium of fir bark, charcoal and permatill. They also thrive as epiphytes, although their enormous size at maturity can pose problems -they need to be very firmly anchored to a tree. A couple of plants that I cross pollinated in February are currently bearing capsules. We track and record the maturation data for every capsule we produce. When the capsule begins to split, we will sow the seeds in our lab. We plan to distribute some of the flasks and keep some of the seedlings for our collection.